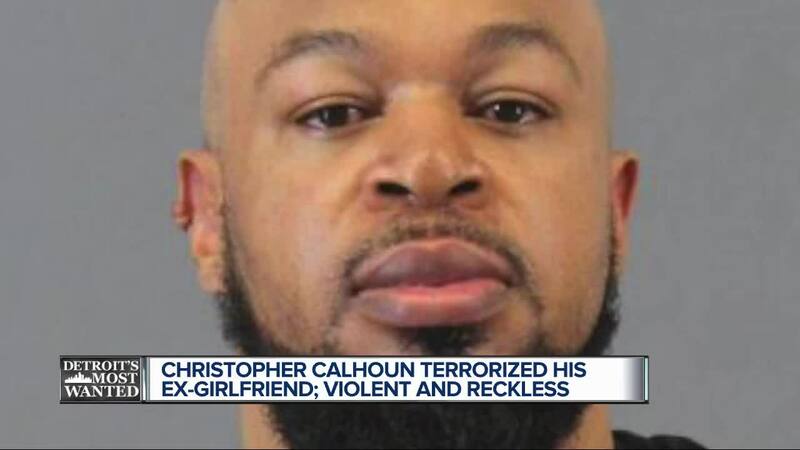 A Detroit man terrorized his ex-girlfriend for months, breaking into her home, burning her car and sending her death threats. When police caught up with him he had weapons and more terrifying evidence of his devious plans, but tonight he’s on the run. The U.S. Marshals say Christopher Calhoun may be one of our most difficult fugitives to locate. They say he’s a mastermind on the dark web, tech savvy enough to virtually disappear and evade capture but still so violent and reckless that when he does reappear, there’s no telling what he’ll do. “When I say terrorizing imagine your windows broken out, somebody stalking you climbing, breaking out your bedroom window,” Deputy U.S. Marshal Aaron Garcia said. Calhoun’s ex-girlfriend describes the months after their break up as a living hell. It was caught on video until the U.S. Marshals say Calhoun cut the line to his ex’s surveillance camera and set her car on fire. “We have information he’s very, very, very much into the dark web,” Garcia said. Those death threats? Pictures outside her house? They came from a burner phone which was untraceable, leaving her helpless and scared for her life. “He’s a very savvy fugitive, this guys been convicted, this guys served time, this guy is a career offender – he knows the system,” Garcia said. He knew enough to get away with it all until Detroit Police conducted a search warrant at his home. What they found was a frightening foreshadowing of what Calhoun could have been planning when sending those death threats. The fourth-time habitual offender was slapped with a long list of charges and convicted. “Aggravated stalking, home invasion second degree, malicious destruction of a building, interfering with communications, the list goes on and on and on and a weapons charge,” Garcia said. But when it came time to serve time and for his ex-girlfriend to finally live in peace, Calhoun took off. “We already know he’s a mastermind with fake ID’s fraud and deception, he has access to weapons and he has a substantial criminal history. That’s why the U.S. Marshals need your help. Christopher Calhoun is 41 years old and he has used his skills to live off the grid but police believe he is still on the west side of Detroit and that he’s easy to spot because of his right deformed ear. “5’9” around 200 pounds, he has a deformed ear and is easily recognizable, I mean that right there you look at him and you should say that’s the guy we want, call the U.S. Marshals right now that’s the guy. And that number is (313) 234-5656. As always there is a cash reward for any fugitives featured on Detroit’s Most Wanted but the U.S. Marshals stress that Christopher Calhoun should be treated as armed and dangerous.